HARDING, HARRIS, educator and Baptist minister; b. 10 Oct. 1761 in Horton, N. S., son of Israel Harding and Sarah Harris; d. 7 March 1854 in Yarmouth, N.S. Although born in Nova Scotia in the early years of New England planter settlement of the province, young Harris Harding returned to Connecticut in the 1770s with his parents, among the many who decided that “Nova Scarcity” was not as attractive as they had been led to believe. According to John Davis*, his later associate and biographer, Harding served during the American revolution on a rebel boat conveying goods from New York to Boston, and on one occasion was held briefly by the British as a suspected spy. Whatever the truth of such stories, Harding returned to Horton in 1783 with his father, who received a land grant from the British government. 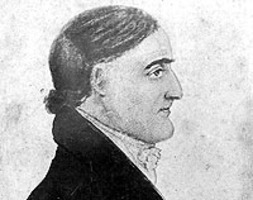 His years in Connecticut meant that Harris had received a better education than most of his later Baptist colleagues, and he kept school in Cornwallis for several years after his return. At the first general meeting of New Lights and Baptists in Cornwallis in June 1798, Harding was charged with “new dispensationism,” which denied the necessity of structured churches with formal rules and stressed the direct relationship between God and mankind [see Edward Manning]. At this time he acknowledged his faults and confessed his errors and was admitted to the association. Baptized himself by James Manning on 28 Aug. 1799, Harding, like most of his fellow evangelical ministers in the Maritimes, had been brought to believer’s baptism by immersion by the end of the 18th century but, although his church moved to the same position in 1806, it continued to allow occasional communion to paedobaptists. As the Baptists gradually took over the association, which became the Nova Scotia Baptist Association in 1800, they began moving to exclude the older “open communion” churches from their ranks. The final break came in 1809, when, almost immediately upon Harding’s completion of the opening sermon, the association voted “to withdraw fellowship from all the churches who admit unbaptised persons to what is called occasional communion and consider themselves a regular close communion Baptist Association.” The Yarmouth church at once withdrew from the association, and did not return for almost 20 years. Although he gradually became more sedentary and travelled less on the revival trail, Harding had the satisfaction of stirring several major awakenings within his own community. The first and most impressive had come in 1806, when 150 new converts were made and most of his congregation were baptized by immersion. Another less intense revival occurred in 1812–13, and they happened sporadically throughout Harding’s pastorate of nearly 60 years. Harding and his church went through a number of bad times as well as good ones. He lost ground to the Methodists under the Reverend Robert Alder* around 1816 and, in his last years, there was much trouble with associate pastors, such as Davis, who were intended to aid the aged minister. Like most of the pioneer evangelicals in the Maritimes, Harding eschewed a fixed stipend, insisting “I do not wish to be a hireling.” As a result he and his family frequently suffered from extreme poverty. Although not a great pulpit preacher, Harding was an effective one, offering extemporaneous sermons richly studded with biblical citations. As Davis observed: “Mr Harding kept no journal. He wrote few letters. His labours from year to year and from one season of revival to another, were marked by but few varieties. The recollections of survivors are but vague and indistinct.” Unlike many of his colleagues, however, Harding was good at pastoral work and visitation. Much of his most effective work was done on such occasions. As Harding grew older he became extremely portly, so that “his length and breadth seemed to be so nearly equal as to suggest ideas of the square and cubical.” Instead of turning him into a comical figure, however, his size and gravity made him extremely impressive and he was one of the beloved figures of his denomination. Simeon Perkins, The diary of Simeon Perkins, 1790–1796 and 1797–1803, ed. C. B. Fergusson (Toronto, 1961 and 1967). Bill, Fifty years with Baptist ministers. John Davis, The patriarch of western Nova Scotia: life and times of the late Rev. Harris Harding, Yarmouth, N.S., intro. J. W. Nutting (Charlottetown, 1866). Levy, Baptists of Maritime prov., 70–71. G. A. Rawlyk, “From Newlight to Baptist: Harris Harding and the second great awakening in Nova Scotia,” Repent and believe: the Baptist experience in Maritime Canada, ed. B. M. Moody (Hantsport, N.S., 1980), 1–26. J. M. Bumsted, “HARDING, HARRIS,” in Dictionary of Canadian Biography, vol. 8, University of Toronto/Université Laval, 2003–, accessed April 20, 2019, http://www.biographi.ca/en/bio/harding_harris_8E.html.